Susan, one of the Senior Physios at Glenhuntly Road Physiotherapy Clinic, loves her tennis! Here is her take on the latest craze that has taken over tennis clubs around the world, and some tips on how to prevent injuries. 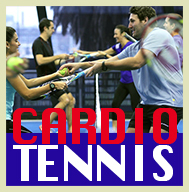 As a keen Cardio Tennis participant myself, my advice would be: try It – Cardio Tennis is FUN! It’s a great way to get fit, socialise and improve your tennis skills, regardless of ability. The session lasts an hour and is a high intensity workout with music where you hit, volley and run your way through tennis drills. You don’t need to be good at tennis to join in and get a challenging workout. The drills are designed to make you move your feet, practice your ground strokes, volleys and serves. Body weight and plyometric exercises are interspersed to keep you moving and your heart rate elevated. There are hundreds of centres offering Cardio Tennis across Melbourne – speak with Susan to find out if it suits you or where you could go locally to try it out. Any new exercise regime can lead to musculoskeletal injuries – and tennis has some particular demands. If you are new to Cardio Tennis take it gently for the first few weeks. Sudden changes in direction puts a stress load on your feet, knees, hips and back, so make sure you are doing some strength and stability exercises to complement your Cardio Tennis sessions. Lunging, squatting and jumping places extra load through tendons, ligaments and joints. Ensuring good form will prevent unnecessary strain through these areas. Correct biomechanics, strength and stability will prevent most of the common injuries that occur during sport and particularly any new activity. All the physiotherapists at Glenhuntly Road Physiotherapy are well qualified to assist you with focussing on any specific needs and can design the optimal program for your body type and your activity of choice. If Cardio Tennis has tweaked your interest at all, we have a special offer for the next month only. Call the clinic for an appointment and mention this article before 15 February 2015 to receive a full Strength and Flexibility assessment at half the normal fee.